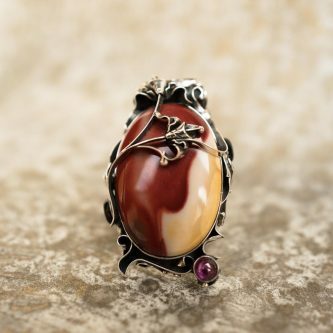 Mookaite promotes an ‘ageless spirit’, helping you accept change and inspiring you to seek new experiences. It awakens your natural instincts in knowing the right direction to explore. By increasing self-worth and self-confidence, it leads to the realization of your potential. Mookaite empowers you to experience and connect with the electromagnetic energy currents of the Earth. It enables you to utilize these positive planetary energies to increase the strength of your will, thus helping you focus your personal power. It can help with procrastination. Keeping you focused and grounded, it is great support for staying on task, following through, and finishing projects.